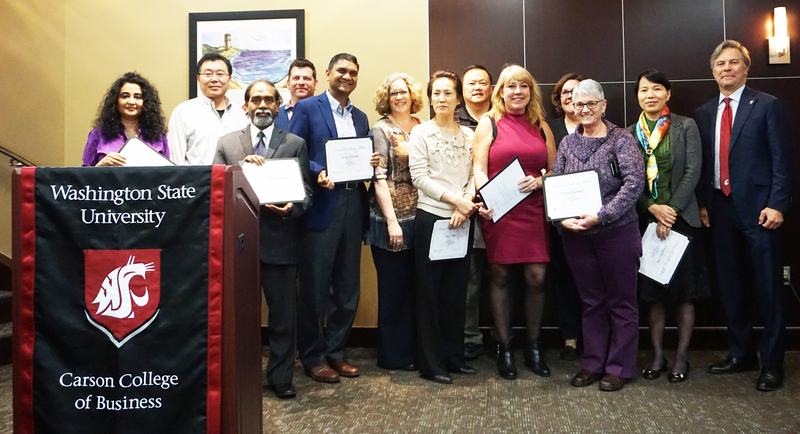 PULLMAN, Wash. – The Carson College of Business recently honored its outstanding faculty, staff and graduate students during an annual awards event at Washington State University Pullman. Outstanding Pullman MBA Faculty of the Year: Ken Butterfield, Department of Management, Information Systems and Entrepreneurship, transfers his wide knowledge to students and shows a strong desire to help them apply classroom material to real life. His respect of students, quality of instruction and approachability distinguish him among faculty. Outstanding Online MBA Faculty of the Year Award: Darrel Muehling, Department of Marketing and International Business, delivers interesting lectures that are a creative mix of online materials. Online MBA students recognize his informative, relatable and humorous teaching style that invites students to contribute. Outstanding Executive MBA Faculty of the Year Award: Velle Kolde, Department of Management, Information Systems, and Entrepreneurship, is a role model to students. His wealth of knowledge and experience along with his entertaining style, advance students’ learning. Outstanding Graduate Student Research Award: Scott Connors, Department of Marketing and International Business, is the lead author on papers submitted to and published in leading journals and gave three presentations at the Association for Consumer Research conference and one at the Society for Consumer Psychology. Hyounae Min, Department of Hospitality Business Management, has an impressive research record. During her doctoral program, she was lead author on and second author on a sixth paper. Two of her publications are in top business journals, a rare accomplishment for graduate students. Outstanding Graduate Student Teaching Award: Ismail Karabas, Department of Marketing and International Business, is a doctoral student who captures students’ attention and engages them in the courses he teaches. Students consistently evaluate him very highly and recognize him for being approachable, available, and open to questions. Outstanding Graduate Student Service Award: Benyawarat Nititahnatshinapat, Department of Management, Information Systems and Entrepreneurship, is a teaching assistant who proactively shares best practices and mentors students struggling with the technical aspects of the courses she teaches. She often volunteers help during business plan competition, and assists faculty even when she is not assigned to them. Outstanding Staff Award: Sue McMurray, assistant director of communications, demonstrates high commitment to quality, knowledge of the industry and willingness to go the extra mile to best represent the Carson College of Business. In the last year, she expanded the college’s award winning alumni publication from a yearly print piece to a quarterly online publication, in addition to publishing many press releases and editing over 20 media articles for publication. Outstanding Clinical Faculty or Nontenure Track Faculty Award: Marie Mayes, Department of Management, Information Systems, and Entrepreneurship, facilitates collaborative efforts with the Voiland College of Engineering and Architecture in the realm of entrepreneurship. She manages the successful business plan competition and leads the CCB Frank Fellows, Boeing Scholars, and e-connect programs, increases networking with external constituents and teaches entrepreneurship. Florian Zach, Department of Hospitality Business Management WSU Vancouver, performs quality work in his area of innovative tourism and collaborates with faculty outside of HBM and with international colleagues. He tirelessly promotes HBM to regional community colleges, high schools, and industry leaders. He is an excellent teacher committed to students’ professional advancement. Outstanding Faculty Scholarship & Research Award: Tom Allison, Department of Management, Information Systems, and Entrepreneurship, is a productive researcher and published several papers in top business journals. He also wrote a book chapter and presented his work at a variety of highly regarded academic conferences. Outstanding Faculty Teaching Award: Jeff Joireman, Department of Marketing and International Business, demonstrates exemplary teaching across all levels and received very high teaching evaluations. He chaired several dissertation committees and served as a committee member on outside students’ projects, in addition to leading a study abroad program. Outstanding Faculty Service Award: Ken Butterfield, Department of Management, Information Systems, and Entrepreneurship, cares about the success of department members and strives to provide the resources and support each needs. He listens to the students’ needs and provides guidance for their success. An example of his commitment to service includes revising the management and entrepreneurship programs in a single year. 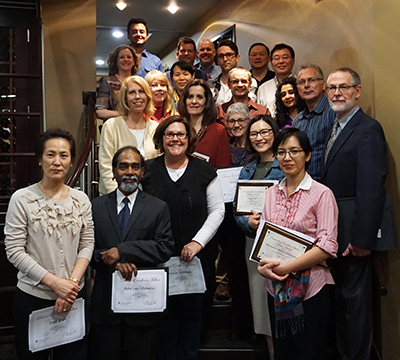 School of Hospitality Business Management: Christina Chi, professor; Robert Harrington, professor, WSU Tri-Cities; Jenny Kim, associate professor and Craig Shafer Fellow; Jenni Sandstrom, clinical assistant professor; Nancy Swanger, director and associate dean; Florian Zach, clinical assistant professor, WSU Vancouver.